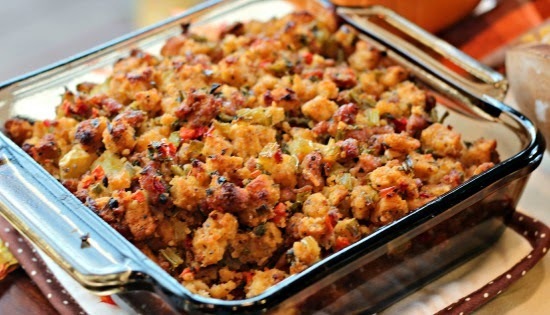 Stuffing is my favorite dish of the holidays. In fact I remember when I was first diagnosed with Celiac disease, my first thought was, " I will never be able to eat stuffing?" That was before I knew better. 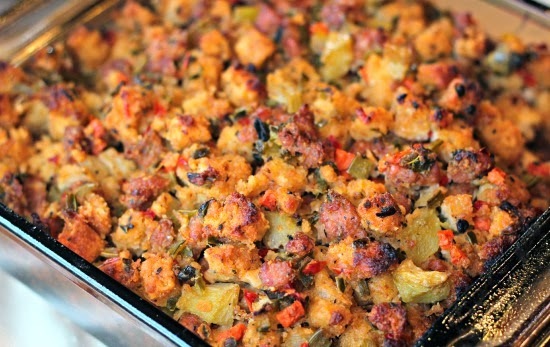 This is my typical stuffing but I made it a bit lighter by using sweet chicken sausage instead of pork sausage. I thought I was making a dairy free stuffing but I definitely dropped the ball on this one. I used ALEIA's GF stuffing mix and I didn't look at the ingredients before I cooked. It turns out this stuffing has milk. I made double the portion because whatever my guests don't finish I will freeze for leftovers! So because my daughter is gluten and dairy free, I will modify this recipe for Thanksgiving. I will be using a GFDF bread, cutting each slice into crouton size pieces, spraying them with olive oil and a little garlic and roasting them in the oven till crisp. I will still use this recipe just a different bread. I also calculated based on 1/4 cup because we will be eating other carbs on this day so we can eat a little bit of each. Personally, I could forgo all the other carbs and just double on this! For maximum flavor I use the chicken stock that is created from the cooked turkey. Remove from heat and put into an oven safe dish sprayed with Pam. Bake covered for about 35 minutes and uncover for another 10-15 min or till top is browned. Although thanksgiving is all about turkey, yet my family had a tradition to cook a dish including chicken. This is a delicious dish. Thank you for sharing. you're welcome! you can use the same seasoning for chicken and it would be just as good!